It's not your father's workplace anymore - today's workforce is increasingly composed of younger workers who have grown up with technology and made it an essential part of their daily lives. 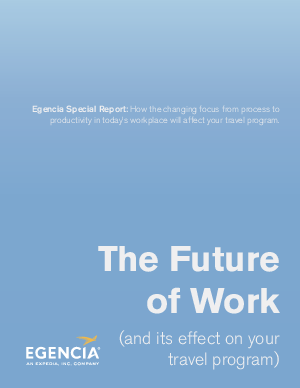 Egencia, the corporate travel division of Expedia, polled Travel Managers and business travelers to learn how this changing focus from process to productivity is affecting their travel program. We've compiled the results in the Special Report, "The Future of Work".